Green Shine isn’t your regular car wash. In fact, Green Shine eliminates one of the most costly and wasteful resources used in car washes today—water! Larkin Hoffman drafted Green Shine’s Franchise Disclosure Document, allowing the company to offer waterless car washes in much of the U.S.
Green Shine Franchise Company, LLC, based in Miami, Florida, offers franchises for ecofriendly detailing and waterless car washes which can operate from fixed locations, popup tents, and from a mobile unit. 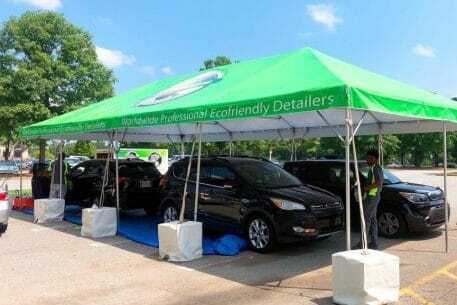 Green Shine car washes use proprietary high-end cleaning solutions called Protec Smart Liquid that eliminate the need to use additional water or other harsh chemicals. Protec Smart Liquid is an alternative to the traditional detergent used by water-based car wash systems. The concept was originally born in Guatemala, before its founder, Juan Sagastume, moved the headquarters to Miami, Florida. Currently, Green Shine has 4 company-owned locations in Florida, 1 franchisee-owned location in Georgia, and several in the Middle East. The company sees significant growth potential, especially in key markets in the U.S. Green Shine is also offering franchises internationally. Larkin Hoffman worked with the founder in structuring the franchise program, and in drafting a Franchise Disclosure Document, Franchise Agreement, and ancillary agreements. Today, Green Shine offers waterless car washes in over half of the country, especially in the southern half of the U.S. If you are interested in learning more about Green Shine, contact Juan Sagastume at 305-852-7262 or info@gogreenshine.com.